Download "Liability Set Asides Why There is a Need for Codification"
1 Liability Set Asides Why There is a Need for Codification Jason D. Lazarus, Esq. For many years personal injury cases have been resolved without consideration of Medicare s secondary payer status even though since 1980 all forms of liability insurance have been primary to Medicare. At settlement, by judgment or through an award, an injury victim would receive damages for future medical that were Medicare covered. However, none of those settlement dollars would be used to pay for future Medicare covered health needs. Instead, the burden would be shifted from the primary payer (liability insurer or Workers Compensation carrier) to Medicare. Injury victims would routinely provide their Medicare card to providers for injury related care. 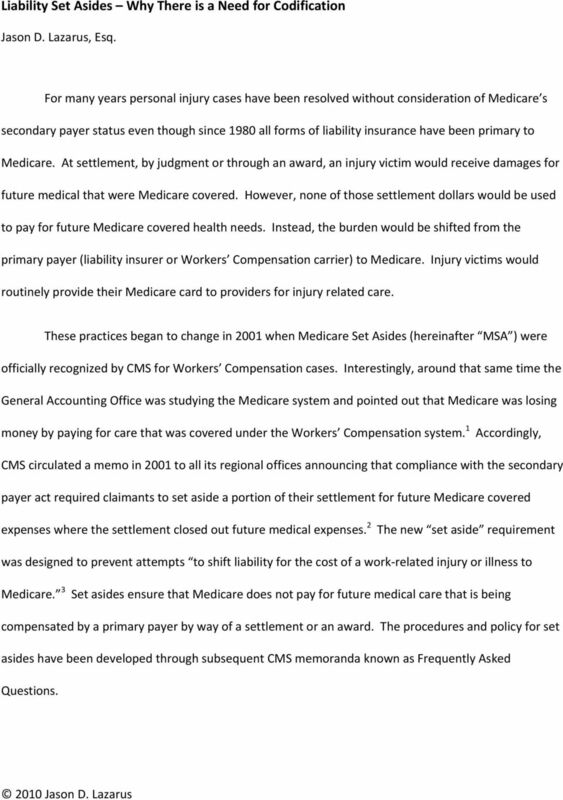 These practices began to change in 2001 when Medicare Set Asides (hereinafter MSA ) were officially recognized by CMS for Workers Compensation cases. Interestingly, around that same time the General Accounting Office was studying the Medicare system and pointed out that Medicare was losing money by paying for care that was covered under the Workers Compensation system. 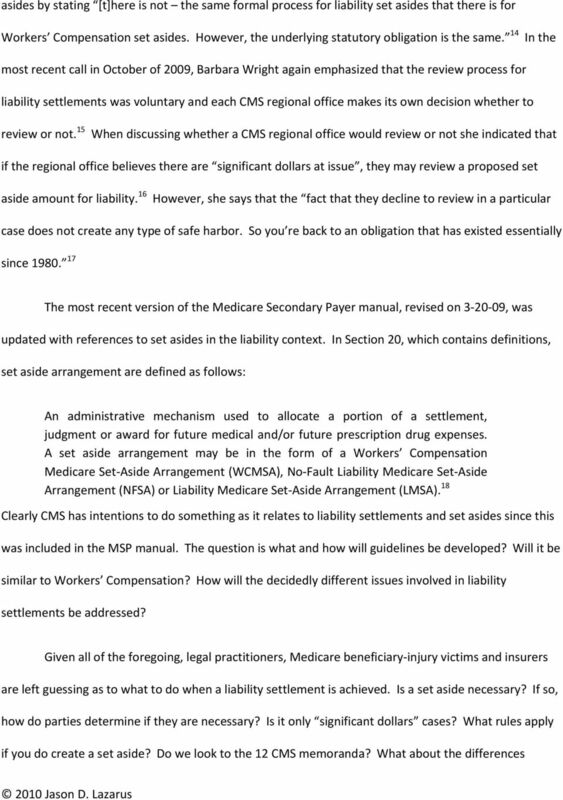 1 Accordingly, CMS circulated a memo in 2001 to all its regional offices announcing that compliance with the secondary payer act required claimants to set aside a portion of their settlement for future Medicare covered expenses where the settlement closed out future medical expenses. 2 The new set aside requirement was designed to prevent attempts to shift liability for the cost of a work related injury or illness to Medicare. 3 Set asides ensure that Medicare does not pay for future medical care that is being compensated by a primary payer by way of a settlement or an award. The procedures and policy for set asides have been developed through subsequent CMS memoranda known as Frequently Asked Questions. 6 between Workers Compensation cases and liability cases? Will CMS take into account policy limits in a liability case in determining the sufficiency of an allocation? What happens if policy limits are $50,000 and the future Medicare covered services are $150,000? 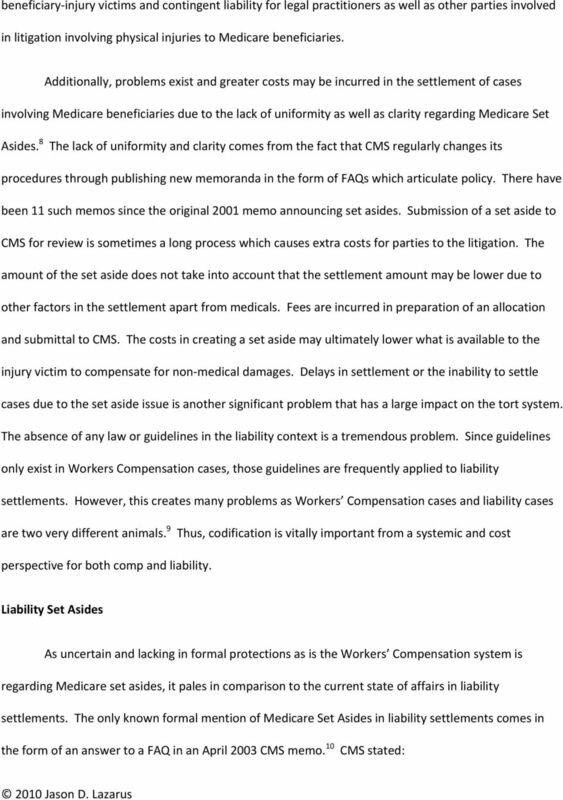 Will CMS take into account comparative fault/contributory negligence issues that may reduce recovery? What about statutory or constitutional caps on damages? Can CMS fail to pay for Medicare covered services post liability settlement for the Medicare beneficiary injury victim if there is no set aside created? It should be painfully obvious from the foregoing discussion that codification of set asides is imperative. Given the possible loss of Medicare benefits, as threatened by CMS, a Medicare beneficiary has significant risks when it comes to Medicare Set Asides with little or no corresponding legal remedies. Significant delays persist in the Workers Compensation MSA process which in some instances leads to settlements falling apart. 19 In addition, liability cases brought on behalf of Medicare beneficiaries may decrease due to the possibility of having to put all of the net proceeds into an MSA. As Rick Swedloff put it in his 2008 law review article, it creates a classic situation of can t settle, can t sue. 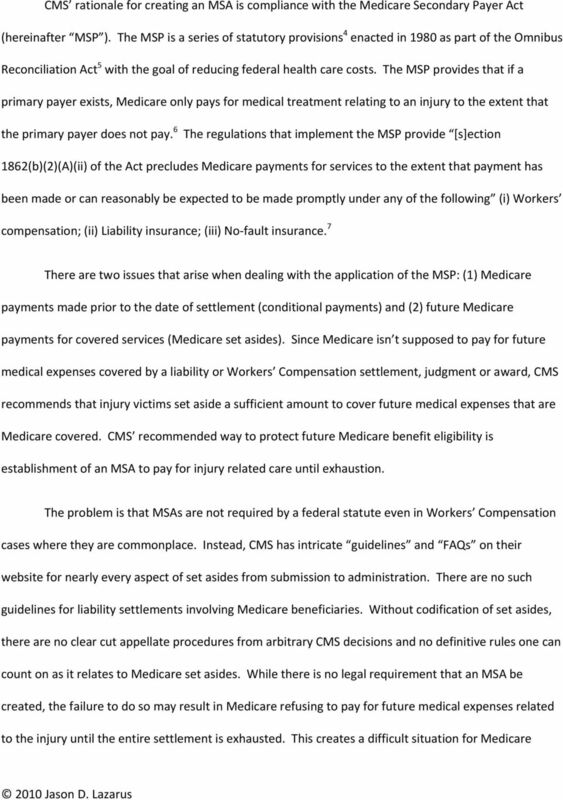 20 In the context of conditional payments, he said that the MSP discourages Medicare beneficiaries and their contingency fee attorneys from bringing suit in simple tort disputes. 21 That statement is all the more profound today in the face of the increasing complexities of conditional payments and the confusion over Medicare Set Aside issues. 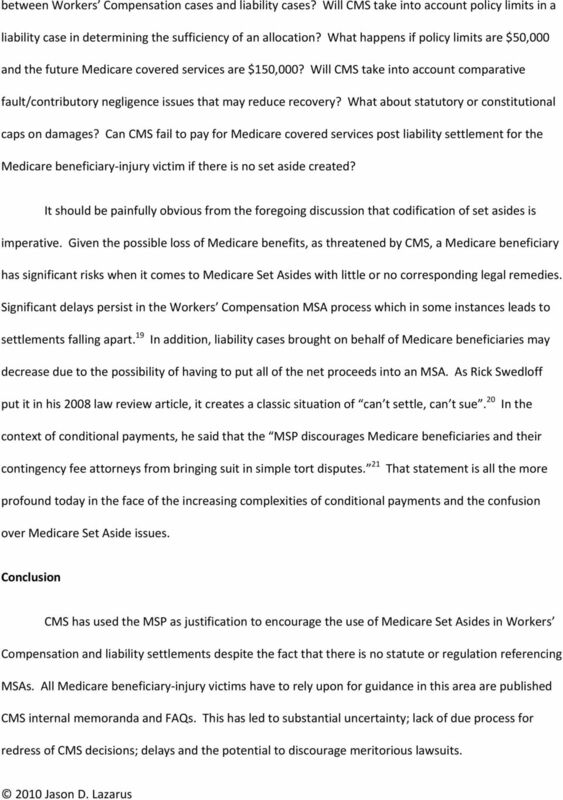 Conclusion CMS has used the MSP as justification to encourage the use of Medicare Set Asides in Workers Compensation and liability settlements despite the fact that there is no statute or regulation referencing MSAs. All Medicare beneficiary injury victims have to rely upon for guidance in this area are published CMS internal memoranda and FAQs. This has led to substantial uncertainty; lack of due process for redress of CMS decisions; delays and the potential to discourage meritorious lawsuits. 7 I believe the ABA put it best that [b]ecause CMS has been unable to fix the problems, legislation is needed to provide for certainty, predictability, and efficiency to this set aside process which was mandated by Medicare without statute or regulation referencing MSP set asides or providing for a CMS settlement review process. 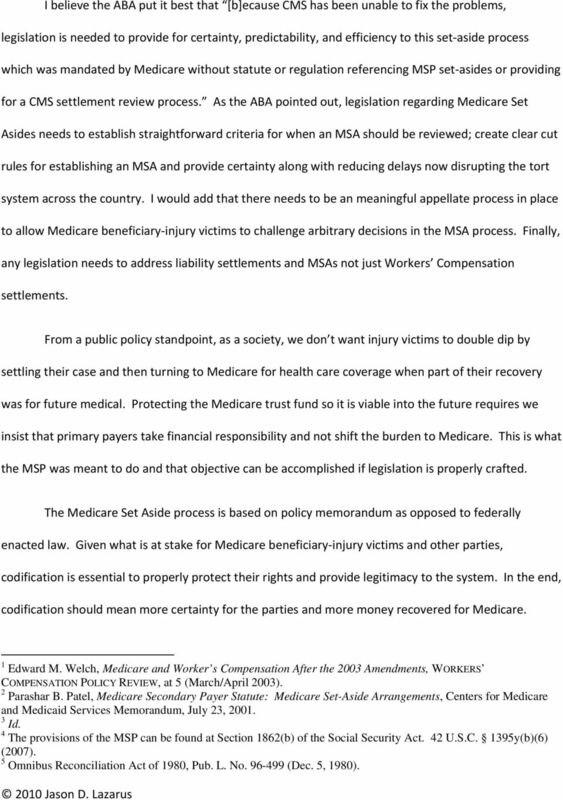 As the ABA pointed out, legislation regarding Medicare Set Asides needs to establish straightforward criteria for when an MSA should be reviewed; create clear cut rules for establishing an MSA and provide certainty along with reducing delays now disrupting the tort system across the country. I would add that there needs to be an meaningful appellate process in place to allow Medicare beneficiary injury victims to challenge arbitrary decisions in the MSA process. Finally, any legislation needs to address liability settlements and MSAs not just Workers Compensation settlements. From a public policy standpoint, as a society, we don t want injury victims to double dip by settling their case and then turning to Medicare for health care coverage when part of their recovery was for future medical. Protecting the Medicare trust fund so it is viable into the future requires we insist that primary payers take financial responsibility and not shift the burden to Medicare. This is what the MSP was meant to do and that objective can be accomplished if legislation is properly crafted. The Medicare Set Aside process is based on policy memorandum as opposed to federally enacted law. Given what is at stake for Medicare beneficiary injury victims and other parties, codification is essential to properly protect their rights and provide legitimacy to the system. In the end, codification should mean more certainty for the parties and more money recovered for Medicare. 1 Edward M. Welch, Medicare and Worker s Compensation After the 2003 Amendments, WORKERS COMPENSATION POLICY REVIEW, at 5 (March/April 2003). 2 Parashar B. Patel, Medicare Secondary Payer Statute: Medicare Set-Aside Arrangements, Centers for Medicare and Medicaid Services Memorandum, July 23, Id. 4 The provisions of the MSP can be found at Section 1862(b) of the Social Security Act. 42 U.S.C. 1395y(b)(6) (2007). 5 Omnibus Reconciliation Act of 1980, Pub. L. No (Dec. 5, 1980). 8 6 42 CFR (2) Part 411, Subpart B, (2007). 7 Id. 8 Eric J. Oxfeld, Congress Must Reform Medicare Set Asides, FLA. UNDERWRITER, May 2006, at S-9. 9 Zinman v. Shalala, 67 F.3d 841, 846 (9 th Cir. 1995). The Zinman court recognized how different Workers Compensation settlements are from liability. The court pointed out that [a]pportionment in workers' compensation settlements therefore involves a relatively simple comparison of the total settlement to the measure of damages allowed for individual components of the settlement, pursuant to a prescribed formula. Tort cases, in contrast, involve noneconomic damages not available in workers' compensation cases, and a victim's damages are not determined by an established formula. Apportionment of Medicare's recovery in tort cases would either require a factfinding process to determine actual damages or would place Medicare at the mercy of a victim's or personal injury attorney's estimate of damages. 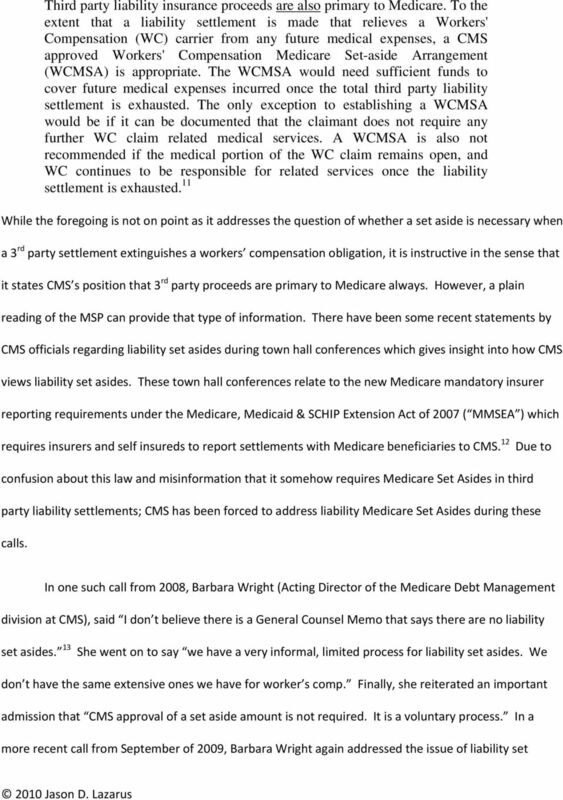 10 Thomas Grissom, Medicare Secondary Payer Workers Compensation (WC) Frequently Asked Questions, Question 19, Centers for Medicare and Medicaid Services Memorandum, April 22, Id. 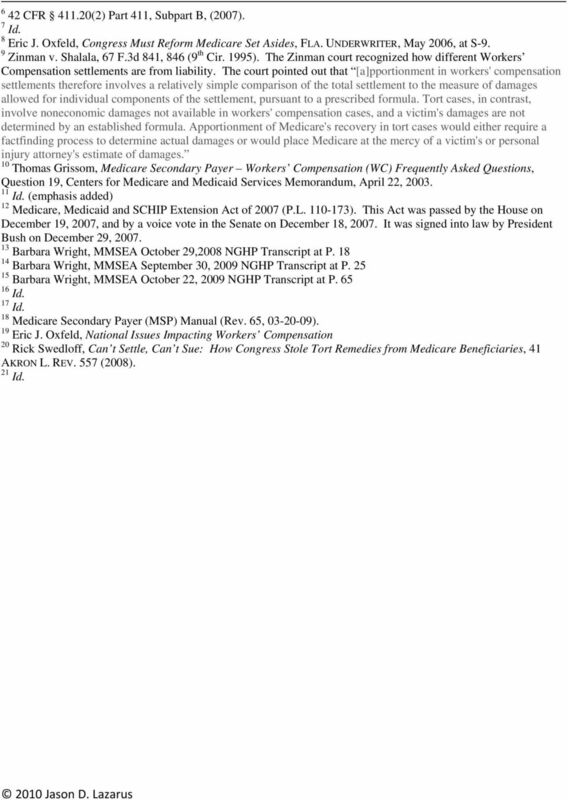 (emphasis added) 12 Medicare, Medicaid and SCHIP Extension Act of 2007 (P.L ). This Act was passed by the House on December 19, 2007, and by a voice vote in the Senate on December 18, It was signed into law by President Bush on December 29, Barbara Wright, MMSEA October 29,2008 NGHP Transcript at P Barbara Wright, MMSEA September 30, 2009 NGHP Transcript at P Barbara Wright, MMSEA October 22, 2009 NGHP Transcript at P Id. 17 Id. 18 Medicare Secondary Payer (MSP) Manual (Rev. 65, ). 19 Eric J. Oxfeld, National Issues Impacting Workers Compensation 20 Rick Swedloff, Can t Settle, Can t Sue: How Congress Stole Tort Remedies from Medicare Beneficiaries, 41 AKRON L. REV. 557 (2008). 21 Id.